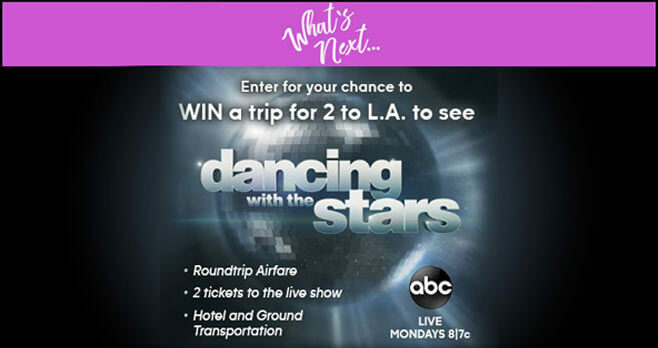 Fans of ABC’s Dancing With The Stars can now enter the Win What’s Next Sweepstakes by registering online at winwhatsnext.com for a chance to win a trip for two to Los Angeles, California to see Dancing With The Stars. The Dancing With The Stars Win What’s Next Sweepstakes is open only to legal residents of the 50 United States and Washington D.C., who are at least 18 years of age (or the age of majority in the jurisdiction of their residence. The Sweepstakes begins on or about 12:00:01 a.m. ET on September 12, 2018 and ends at 11:59:59 p.m. ET on November 25, 2018. Limit one (1) entry per person per day during the Promotion Period. The grand prize consists of a 3-day/2-night trip for the winner and a guest to Los Angeles, CA to attend a live taping of an episode of the Show during the Spring 2019 season. Visit winwhatsnext.com to enter and see Official Rules for details. My daughter is fascinated by the art of dance and I would love to take her to experience Dancing With The Stars as our first mother-daughter vacation.